I wanted to write up a quick message to tell you about allfreecrochet.com – a great website for free crochet patterns! What’s great about this website is you can create a profile and add patterns to your queue. It is a great place to find new ideas, with a seriously huge database of crochet magic. I do have a handful of my patterns published here as well, find me by searching “Sewrella” in the search bar at the top left corner of the page. You’ll get to a page that looks like this and from there you can see all of my patterns! 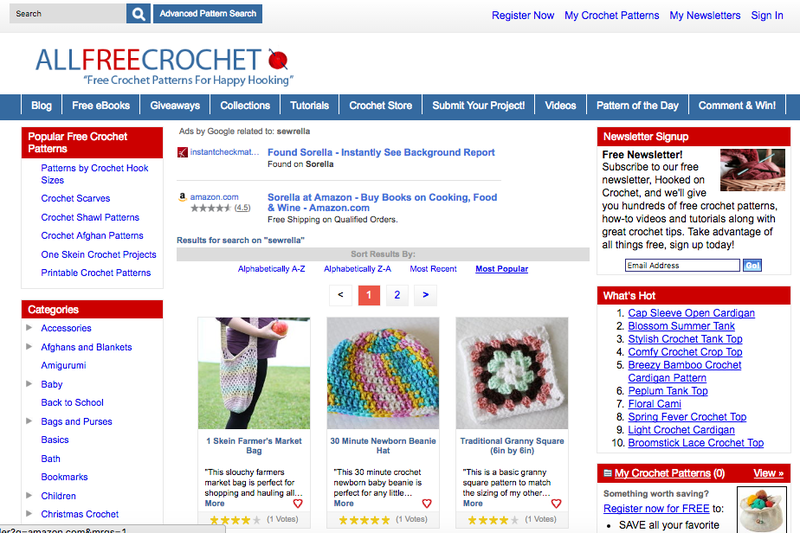 On allfreecrochet.com you can also leave reviews of patterns, see popular designs on the “What’s Hot” list and search for patterns using all different types of search criteria – even hook size! Check out this awesome crochet resource, and add my patterns to your queue!